Sue me - but I cant find a flaw in this film. After watching a film so overburdened with expectations...and still walking out appreciating it...there must be something fantastic at work here. Paa, the new baby from the Bachchan household (and ABCL) (and the only baby despite constant rumors about Ash and Abhi) doesnt disappoint. How important the film is to the family is obvious with the amount of effort they are putting into its promotions. And wearing that makeup must be a commendable task for senior! But for a moment, do this. Forget who this movie is made by. 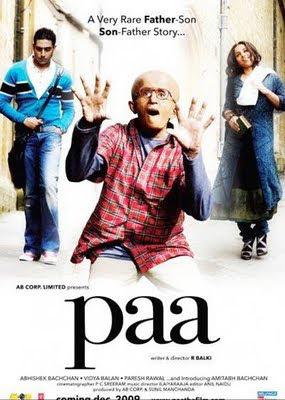 Forget that the 12 year old boy in the film is actually India's living legend 5 times that age. Dont try to find Amitabh in the film. Coz you wont see him. And then, trust me, you will love the film as much as I did. One would expect it to be a tear jerker. A yound kid with a rare disease that makes his body age 5 times faster than his real age. Kids can be brutal with peers about such diseases. Add to it, he's born out of wedlock which makes life a little more complicated for him. The perfect recipe for a teary film? That's what I thought when I walked in. Thankfully - when I walked out, I thought differently. The story line of the film is well known by now. A student of gynocology and an aspiring politician fall in love and have a child. The child has a rare disorder in which his body ages 5-6 times faster than his real age. Thus, 12 year old Auro actually looks 65. Simple story. But the movie works...and how. And it works because of 5 fantastic performers. So lets go in ascending order. At number 5 is the actress who plays Vidya Balan's mother. Brilliant performance. Strong. Touching. Real. At number 4, we have younger Bachchan. As much as I dislike most of his films with the exception of Guru and Bunty aur Bubbly, the effort he puts in for this role shows right through. He's believable, smart, reminds us of Rahul Gandhi and Sachin Pilot as intended and is instantly likeable. The white kurta pyjamas that the sports through the film suit him much better than most looks he has experimented with. At number 3, we have Vishnu - Auro's best friend. This little 2/2 kid with his witty one liners is fantastic. He's quick, he's funny and he's adorable! At number 2, is an actress that we all love to bash - for immaterial things like her dressing sense. Vidya Balan is one of the most under-rated actors in Indian Cinema. The strength of her performance that we got a glimpse of in Parineeta comes out in full force here. She's strong yet vulnerable....she's beautiful...and she's believable. She doesnt resort to unnecessary theatrics, and yet steals the show. She plays Auro's mother - and does the impossible. She doesnt allow us for a moment to pity the child, but to appreciate him. And she is one of the prettiest actresses in India today. She may not wear tiny dresses, but let someone see her in the film and tell me that she's not gorgeous! Be it her student avtaar with curly hair and skirts or her doctor look with beautiful saris...she personifies elegance here! So let us now come to number 1. As expected, the star of the show is a little boy called Auro. He wins not because of who plays the role. But because of the character given to him. He is hillarious and witty. Auro doesnt solicit sympathy for a moment. Instead, he plays a role that is so funny that we cant wait to see what he says next. The script writer deserves an award here.....and Auro, for bringing the script to life. Many people dont like the film. Say it disappoints them. Pit it against 'The curious case of Benjammin Button'. Dont do that. Its not even a similar story. Dont listen to them either. Go with an open mind and let yourself be entertained. And it shall. Paisa Wasool Moment: Vishnu's quips like "My father doesnt understand me. I'm a creative person na...he cant get me!! One he's given me his face, for which he should be saying sorry to me for the rest of my life....and yet he treats me this way"!! !